The symbol of Geneva is ripe for a photo opportunity. 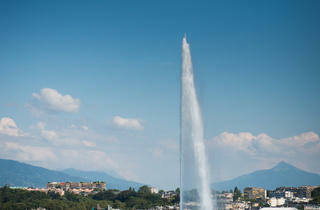 Don’t fight it: as possibly the most recognisable image of Geneva (you can even see it from the plane), it’s practically the law to get your photo taken in front of the city’s giant water fountain. 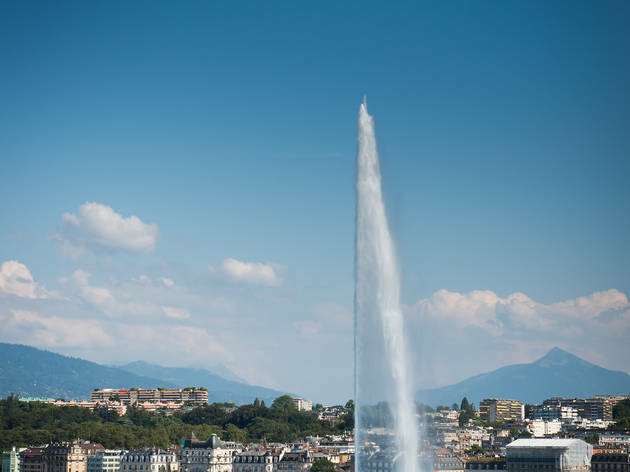 Originally built as a pressure release valve for Geneva’s water supply, rather than for any aesthetic reason, the jet d’eau spurts 500 litres of water per second some 140m (459ft) into the air, before thundering back into Lake Geneva. You can get up close to the refreshing spray by walking the path to the fountain from the lake’s left bank. The jet really comes into its own during the city’s annual August fireworks display, when the colours are reflected and refracted in the spray. The fountain is occasionally switched off in high winds.